Race with world class athletes! 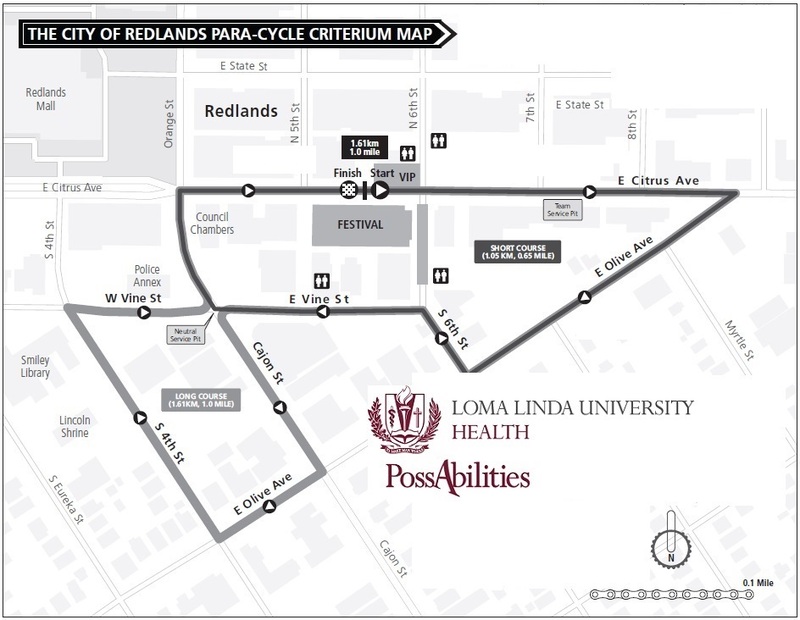 The Redlands Bicycle Classic along with Loma Linda University Health PossAbilities would like to formally invite you to the PossAbilities Para-cycle Race Seriesin conjunction with the 2019 Redlands Bicycle Classic in Redlands, CA, March 13, 2019 through March 17, 2019. The following is important information regarding the race. Please feel free to contact me if you have any questions. Thank you again for supporting the 2019 Annual Redlands Bicycle Classic! Race registration must be completed ONLINE, and IN ADVANCE. PROOF OF A CURRENT USA CYCLING LICENSE IS REQUIRED. Go to https://register.usacycling.org/#!/c/pricing. Go to www.active.com search PossAbilities. Choose PossAbilities Para-cyle Race Series. There will be a mandatory technical meeting on Tuesday evening, March 12, at 5:00 p.m. This meeting is mandatory for all cyclists. If you will not be racing in Wednesday’s time trial but will race in any other races, please arrive in plenty of time the day of your first race to get checked-in. If you are racing on Wednesday but can’t make the Tuesday night meeting, PLEASE EMAIL US to let us know you will not be in attendance. Our goal is to get you checked-in and all of your questions answered at the technical meeting order to make things easier for you on race day! HELMETS ARE REQUIRED for participation in any and all events.UCI HELMET COLORS BY CLASS WILL BE ENFORCED. For 2019, PossAbilities has updated the payout structure. In an effort to enhance the competitiveness of our para-cycling race we have established a total prize payout for the Omnium of $6,875. The first place finisher will receive $1,000! Our new Omnium cash payouts will be based on podium placements over 4 days of racing. This means that for each race you will receive 1 point for first place, 2 for second, 3 for third and so on for each of the racing classifications until your classification group is exhausted. After the last day of racing (Sunday), the athletes with the lowest number of points will be ranked from 1st place (lowest points) to 10th place (highest points). In the case of a tie, your ITT FACTORED time will act as a tie-breaker to decide your cumulative final overall ranking for the Omnium cash prizes. ITT FACTORED time will be based on 2019 National Standards. The first place finisher will receive $500! Prize payouts for T, C, and B classifications will be based on ITT results. However, T, C, and B must participate in the TT and RR in order to qualify for prize payouts. PROTEST PERIOD: A protest regarding the final results must be made within 15 minutes after the posting of results in order for riders to be eligible for prizes. All riders must check in with the para-cycle race director 30 minutes prior to race start. Riders should arrive at the start line at least 15 minutes before their designated start. Riders will start at 30 second intervals for the time trial. If a rider does not start at the appropriate time, the clock will start and will continue to run with or without the rider starting from the designated starting block. Riders who miss their designated start will be started as soon as possible after they arrive at the starting block. The time trial start order will be in race packet and will be provided to all racers at the technical meeting. Athletes are responsible for booking rooms independently. Rooms are limited. You may request a handicapped room, but they are available on a first come, first serve basis. Use “PossAbilities” for a discounted room rate. Use “PossAbilities” for a for a discounted room rate. The first 10 out-of-state athletes to register online for all races in their respective categories will be entitled to a $200 stipend. The first 10 California residents (that live over 60 miles from Redlands) that register online for all races in their respective categories will be entitled to a $100 travel stipend. All recipients of stipends will be required to complete and sign a W-9 in order to receive the stipend. Travel stipends and prize pay-outs will be mailed out within 90 days after the race. Athletes are responsible for their own air/ground transportation. Shuttles will not be provided. Meals are the responsibility of the athlete. Complimentary dinner will be provided to all racers. If you would like to bring a guest(s), please email Cotie Williams at cowilliams@llu.edu. Course is mostly out/back with a fast out and a slow back! From the START LINE the course wanders down past the Learning Resource Center until you reach Campus Drive. Turn right on Campus Drive which is a steep downhill section reaching grades of -15%! This will be a short but fast section where you will want to stay to the left so you can better enter the sharp right hand turn onto Sand Canyon Rd. After turning right onto Sand Canyon Rd. (entire road will be closed to vehicular traffic) you will descend down Sand Canyon Rd. for about 3 miles at a very fast pace where you will reach TOP SPEED!! Be careful as anything not tightly fastened to your bike will tend to pop out as a result of intense vibrations caused by the road surface. NOTE: Sand Canyon Rd. will change names to 5th Ave. (it’s still the same street). The course then turns right on Dearborn St. Please be aware that only the left side of Dearborn St. will be closed to cars. Head down Dearborn St. until the Race Marshalls signal you to turn left into the turn-a-round at Moore Middle School. The remainder of the course is mostly a repeat of the first half descent but now you will be climbing the rest of the way back. As you return on Sand Canyon Rd. the Race Marshalls will instruct you to turn left on Campus Drive (different from how you exited the college). From Campus Drive the Race Marshalls will direct you to turn right on Emerald View Drive until you reach the FINSH LINE. The course is mostly well paved and in good condition with the exception of a few spots on your way down the fastest section of Sand Canyon Rd. Registration and check-in will take place at the PossAbilities van in the parking lot. There will be an awards ceremony for all para-cycling categories. This will take place immediately following the conclusion of the time trial. This race course is the same familiar residential neighborhood but with significant differences from years past! 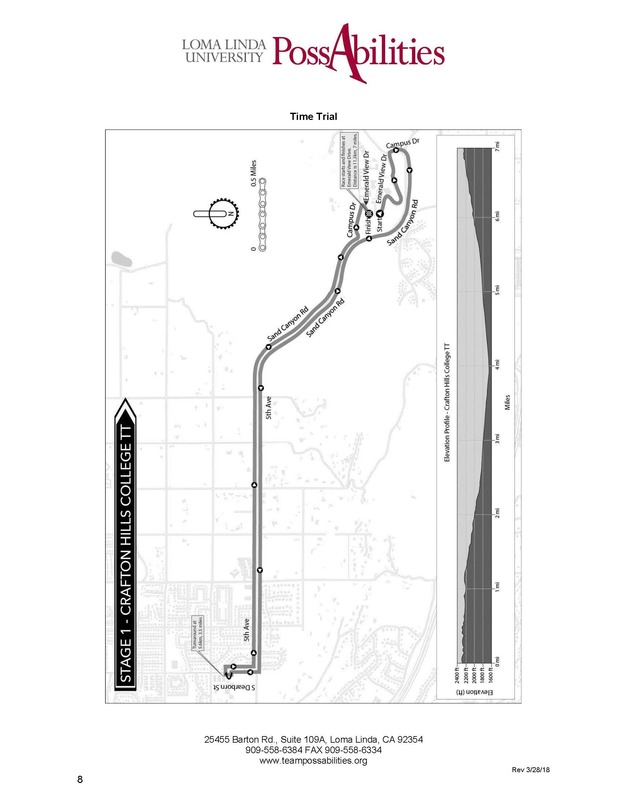 From the START LINE the course will immediately (50 meters) turn left on Tahoe Drive. Turn right on Golden Hills Drive. Turn right on Summerwood Drive where you will begin to climb. A sharp right turn on Sunnyside Drive before making a sharp left turn up the Fir Ave. climb a 90 degree turn follows on Bryant St. where you will ride straight until you reach Oak Glen Rd. A final right turn on Sunnyside Drive until you reach the FINISH LINE. As many laps as can be completed in 75 minutes. Race ends on leader’s lap. From Redlands, go east on I-10. Exit Oak Glen Rd./Live Oak Canyon Rd. Google directions to Yucaipa Community Center, 34900 Oak Glen Rd, Yucaipa, CA 92399. Parking will be in the North end parking lot on Sunnyside Drive at the Yucaipa Community Center located at 34900 Oak Glen Rd, Yucaipa, CA 92399. 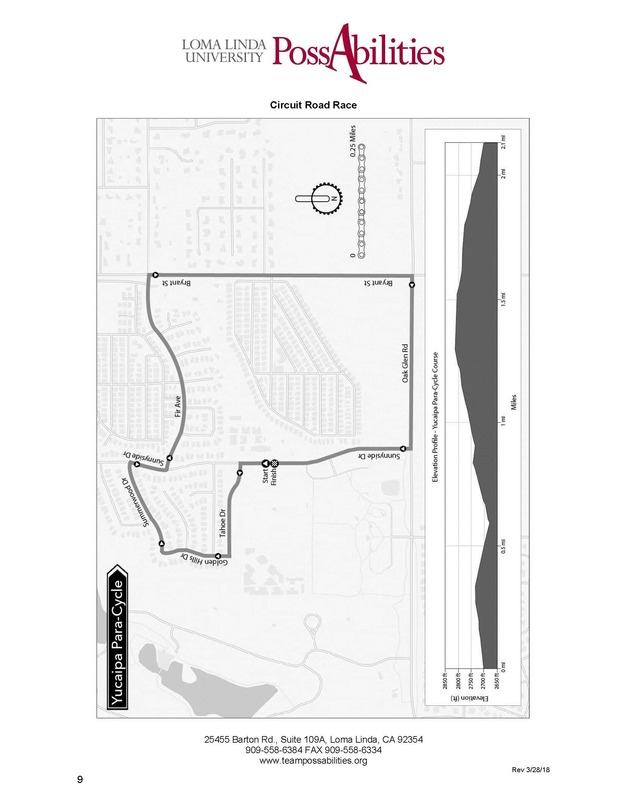 1 mile criterium circuit with 7 right hand turns. Technical with wide roads. All cyclists will race together, but will be scored in separate race categories. Every racer will finish on the overall winners lap...regardless of laps completed to that point. On 8th and 9th Street between State Street and Citrus Ave., and in parking lot between 8th and 9th Streets. .65 mile criterium circuit with 5 right hand turns. Technical with wide roads. All cyclists will race together, but will be scored in separate race categories. Every racer will finish on the overall winners lap...regardless of laps completed to that point.